A revered figure among MLB fans and collectors, Adrian Beltre accomplished plenty during his 21-year career. 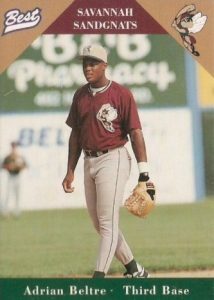 The following guide offers up some of the best Adrian Beltre cards available with an emphasis on his earliest releases. Beltre's power at the plate and amazing defensive skills at third base have made him a strong contender to one day make it to Cooperstown. As one of the top Dominican Republic-born players in baseball history, he found success with multiple teams, including time with the Seattle Mariners, Boston Red Sox, and Texas Rangers. While he was well past his peak when he retired at 39, his final tally of 3,166 hits all but guarantees a Hall-of-Fame invite at some point. Alongside the notable hit total, the very long career has resulted in many Adrian Beltre baseball cards. Shop for Adrian Beltre autograph cards on eBay. Although several pre-rookie cards make the list below, Beltre has many more minor league cards that were not included. 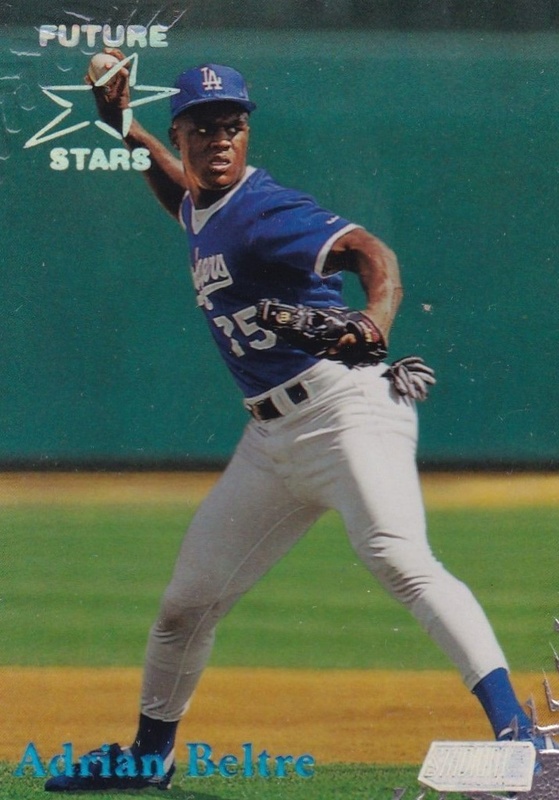 A company called Score Board issued minor league cards in 1997 and Beltre has a card from his brief time in the Florida State League with the Vero Beach Dodgers. As one of the best young sluggers in the game, Beltre was also featured on many combination cards with other stars and retired legends. In 2005 Upper Deck Reflections, Adrian shares an autograph card with Albert Pujols. 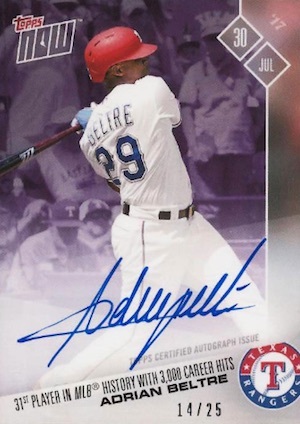 This card can command some of the highest overall prices for a Beltre autograph. In 2004 Upper Deck SP Prospects, he is part of a triple autograph with Los Angeles Dodgers great Duke Snider and prospect Blake DeWitt. In the Passing the Torch autograph insert from 2005 Donruss Elite, Beltre joins Minnesota Twins slugger Harmon Killebrew for an unexpected dual autograph. Although Adrian Beltre autograph cards slowed in Topps and Panini sets during his final years, the options picked back up starting in 2017. In compiling this list, the availability of each card was taken into consideration along with card value and aesthetic design. Also, for an idea of the most popular options at any given time, check out the current Adrian Beltre card auctions on eBay with the most bids. Click on the images or listings to shop for cards on eBay. Bolded links go directly to detailed product or player profiles. 1998 Topps Stadium Club was divided into two releases with the second series featuring Future Stars cards. The Beltre card is part of this subset and it shows him in the process of throwing. Speaking of his throwing prowess, he has five Gold Glove Awards—two while with the Mariners and three while with the Rangers—including the 2016 award as the best fielding third baseman in the American League. 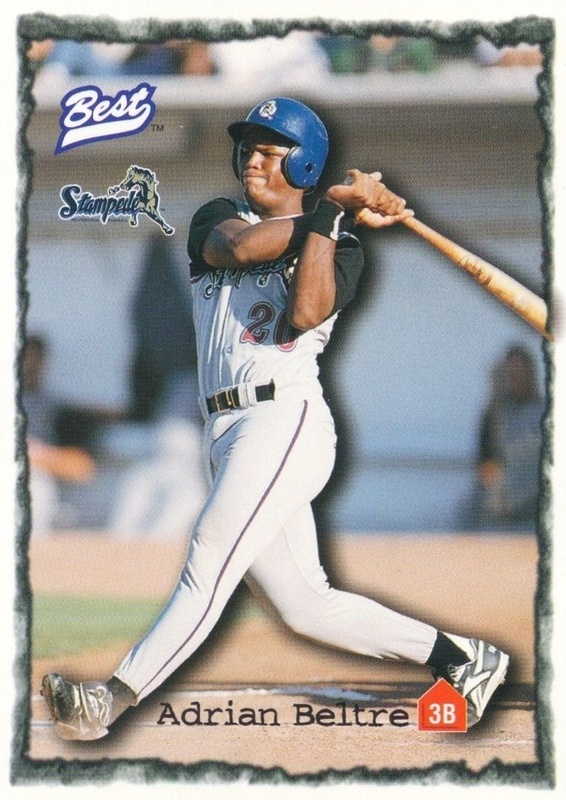 The first of two pre-rookie cards, 1997 Best features Beltre during his time with the Dodgers Class A-Advanced affiliate, the San Bernardino Stampede. Beltre's rise to the majors was a quick one as he jumped straight from AA-ball to the hot corner in Chavez Ravine. 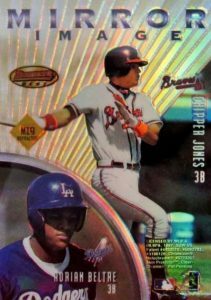 One of the most innovative sets ever issued by Topps was 1998 Tek. The release took the 90-card checklist and created 90 different versions of the same base card. The reverse side of each card explains which design variation was featured on the card. The Beltre card below, with many squares inside each other, is pattern #36. Because Topps printed each design variation at the same rate, there are technically no short-print designs. However, building a full set that essentially includes 8,100 cards is nearly an impossible task. 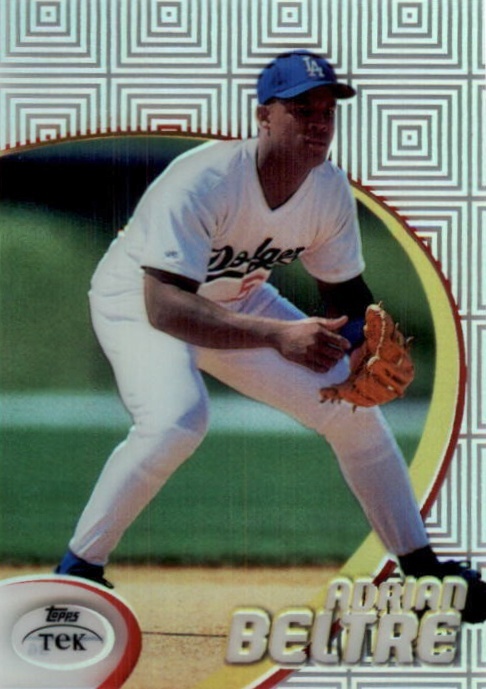 For fans who covet the earliest baseball card appearance of players, the 1996 Best for Beltre is the card to own. 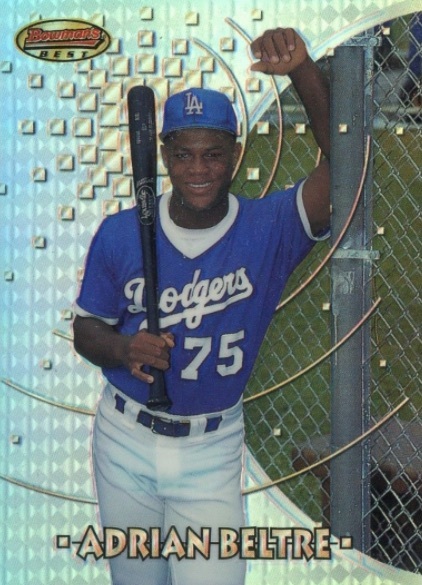 Just 17 in the photo, it was later discovered that the Dodgers had actually broken league rules by signing Adrian to a contract in 1994 when he was only 15. The Dodgers claimed it was not intentional and the confusion stemmed from Beltre's correct date of birth. Major League Baseball would ultimately fine the team and also banned them from recruiting players in the Dominican Republic for a year. Although not numbered, he also has another card in the 30-card set that shows him on the diamond. Celebrating his 3,000th hit on July 30, the print-on-demand 2017 Topps Now card offers a hard-signed Adrian Beltre autograph card. It was made available soon after the achievement, giving collectors a timely keepsake. There are actually a few numbered versions of the on-card autograph, including Green (#/199), Base (#/99), Blue (#/49), Purple (#/25), Red (#/10) and Gold (1/1). In addition, the unsigned base version sold 1,691 copies, and is a much more affordable choice. Beltre is showcased on an insert from 1997 Bowman's Best that features a total of four players, with a rookie and star player sharing each side. Given the name Mirror Image, the idea was that the rookie would live up to the star's legacy. Beltre is found alongside Braves slugger Chipper Jones. 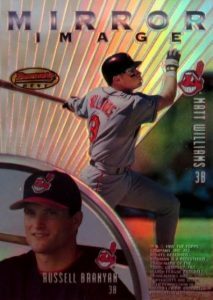 The opposite side of the card features Cleveland Indians teammates Matt Williams and rookie Russell Branyan. Branyan would have a successful career, playing for 14 seasons and earning the nickname "Russell the Muscle" by having several seasons with great home run production. 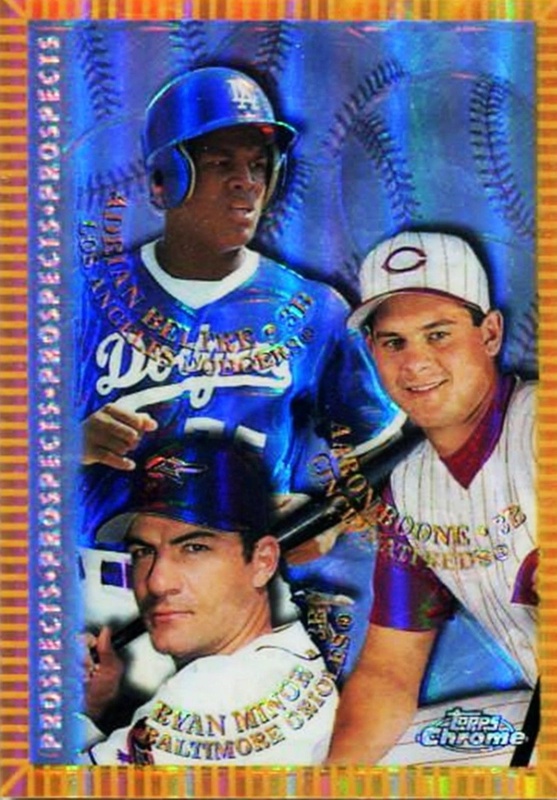 As in previous sets, 1998 Topps Chrome again combined several up-and-coming prospects on a single card, sometimes striking gold by placing multiple future stars together. Beltre is featured with future All-Star Aaron Boone and Baltimore Orioles infielder Ryan Minor. Boone, son of legendary catcher Bob Boone, famously hit a home run in the 11th inning of Game 7 of the 2003 ALCS that sent the New York Yankees to the World Series over the Boston Red Sox. The autograph cards in 1998 Bowman's Best were limited to 10 total players with just five rookies or prospects. They were the five biggest prospects of the day, however, including Beltre, Kerry Wood and Jose Cruz Jr. 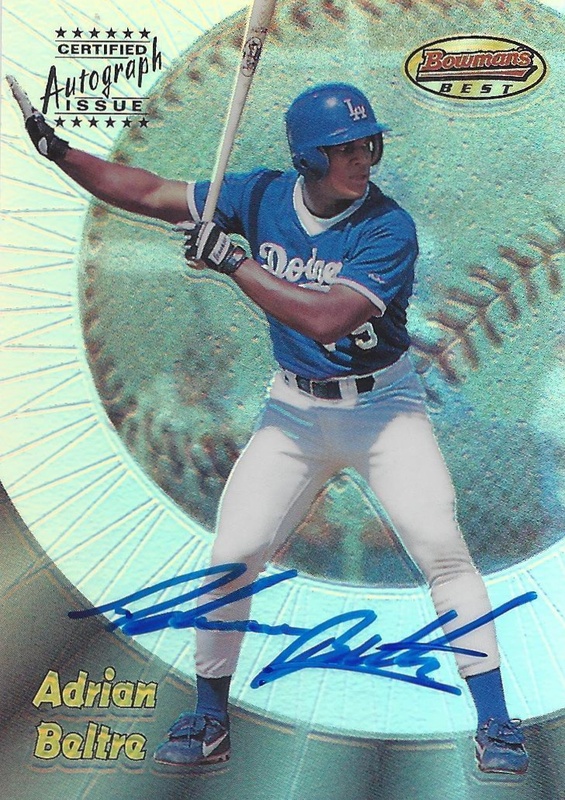 Unlike many players, Beltre's current signature hasn't changed that much from his early years. His full name is often done in one single motion without lifting the pen and his last name appears to be underlined. 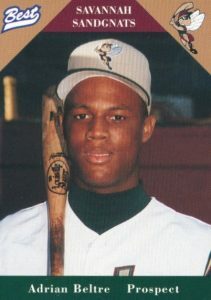 The 1997 Bowman's Best rookie card shows Beltre with a bat on his shoulder and the unusual #75 jersey. When Beltre finally made it to the majors, he would sport #29, which he has worn with all his other teams. The 1997 Bowman's Best set was divided between 100 stars and 100 prospects with the prospects receiving a silver chromium look while the stars were given gold. 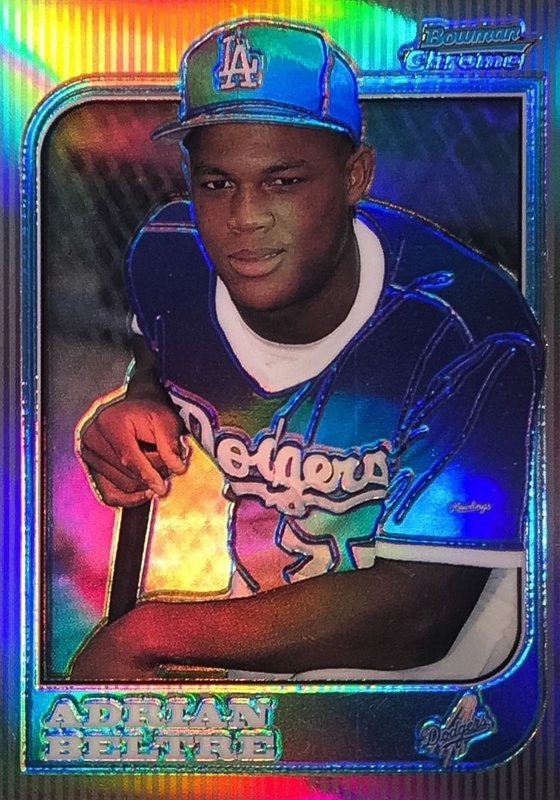 The most popular Adrian Beltre rookie card is without question his 1997 Bowman Chrome appearance. Collectors have placed an even higher premium on the Refractor version (1:12 packs). There is also an International variation with the player's home flag in the background. Those could be pulled 1:4 packs, with International Refractors being found 1:24 packs. Mint Refractor parallels of Beltre's rookie card approach $300, and rare gem-mint copies attract prices that are three times as much. ADRIAN BELTRE Bowman RC Texas Rangers ROOKIE CARD Dodgers Baseball JUST RETIRED! 2014 Topps Gypsy Queen Adrian Beltre FRAMED BLACK PRINTING PLATE #208! #'d 1 1! 2016 Panini Prime Cuts Adrian Beltre Biography SP 4-COLOR LOGO PATCH! #'d 1 5! 2015 National Treasures Adrian Beltre Treasured Material TAG PATCH! #'d 1 4!!! !